An unmarked blue printed version of the soup plate without enameling. An earthenware soup plate printed in blue underglaze and enameled overglaze in red and green with flowers and leaves painted onglaze. The pattern is known as Dragon. A pseudo Chinese symbol is printed in blue by an unknown maker on the back. This pattern is based on a Chinese original design. Anthony Bruce points out in the NCS Newsletter 102, 1996, pp. 14-17, that in the Chinese original design, the dragon extends from the well of the dish over the rim and is continued on the outside. 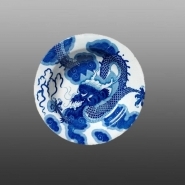 The pattern shown here closely follows the Chinese original except that the full dragon is printed on the front of the dish. As in the Chinese version, the dragon holds in his claws the Flaming Pearl, seen as a round shell like object with squiggly lines protruding from it which represents the flames.